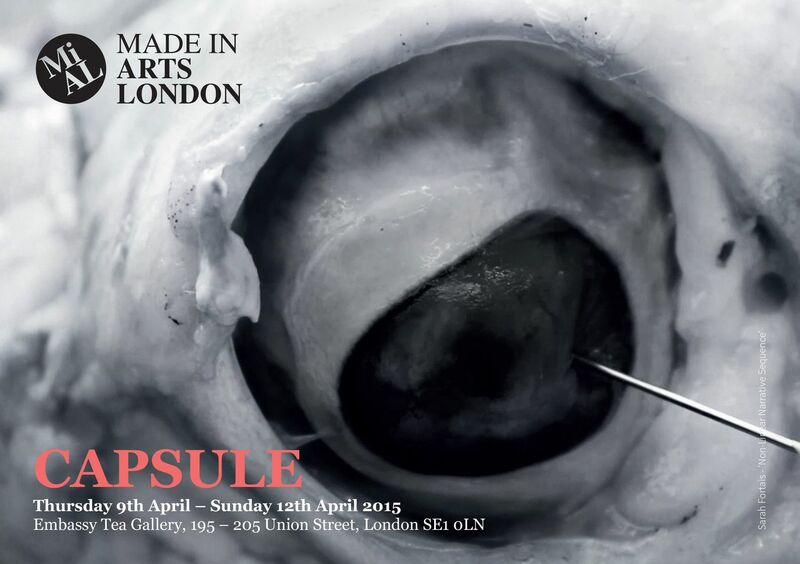 Made in Arts London presents ‘Capsule’ an independent exhibition showcasing the ever developing journey of our emerging artists and designers. Made in Arts London is a not-for-profit enterprise which supports and promotes art and design from University of the Arts London students and recent graduates. We encourage our artists to continue developing their work whilst offering them the advice, support and opportunities necessary to sustain their creative practice. Our job is to spot the emerging talent coming from University of the Arts London and to provide a platform which nurtures this talent and allows for confidence, connections and creativity to flourish. We also facilitate our artists to build a strong foundation for their practice, building their confidence in selling and allowing them to discover the relevant market for their work. Within Made in Arts London we believe that there is huge potential, not only from our incredibly talented artists and designers but also in what MiAL can offer all those involved within our journey. An example of the journey that MiAL and our artists are on can be seen in Sarah Fortais; Sarah has been working with MiAL since we launched in 2012. Sarah has a fascinating background; originally from Ontario, Canada she studied for two years to become a plastic surgeon before changing her mind and coming to the UK to study MA Fine Art at Central Saint Martins. She has produced work in a vast range of mediums including photography, illustration, taxidermy, installation, performance and video. Her work has fluctuated between varying media throughout her time with MiAL but with each project her practice has become increasingly stronger whilst maintaining and progressing the key values and the fascinating dialogue that drives her work throughout. Now studying for her PhD at Slade, Sarah has already accrued a vast array of exhibitions, awards, scholarships, residencies and events within her short career and she no doubt that has a bright future ahead of her in the creative arts. Sarah still regularly works with MiAL, and her imagery 'Non-Linear Narrative Sequence' has been used as the main image to promote this exhibition. Prints from this project will be available at the exhibition, along with a site specific installation, themed around 2001: A Space Odyssey. Although ‘Capsule’ will showcase a wide range of work from a selection of MiAL Artists whose practices differ greatly from one another and who also represent the MiAL message and mission, Sarah’s journey so far embodies everything we encourage from our artists, and indeed everything we encourage in our own journey; a strong belief in self-empowerment and improvement, striving to achieve your goals, and promoting creativity in every aspect of life. ‘Capsule’ is Made in Art London’s third annual independent exhibition, and as a result we have curated a collection of work that showcases new work commissioned from some of our most successful artists, alongside MiAL limited editions and design favourites. There will also be a selection of video and performance pieces as well as works from the MiAL Spring/Summer 2015 collection launching in March; which will be selected by Kathleen Soriano, Natalie Brett and Dominic Wilcox.